The second installment in the Assassin's Creed franchise follows the life of Ezio Auditore da Firenze as he seeks revenge on those who betrayed his family. Assassin's Creed II is Ubisoft's sequel to the popular 2007 action-adventure game, Assassin's Creed. In the continuation of the saga, Assassin's Creed II takes place in Italy in the year 1476. You assume the role of Ezio Auditore de Firenze, the new protagonist of the series, born of the bloodline of the late Altaïr and Desmond Miles from the original Assassin's Creed. This newest entry in the series introduces a revamped combat system, new side quests, a set of new unique abilities, and much more. Rumors of Assassin's Creed II's existence began circulating in mid-2008, but it was officially confirmed by way of a cryptic teaser-trailer on April 6th 2009. Ubisoft announced at their press conference during E3 that Assassin's Creed II is slated for release on November 17th 2009. 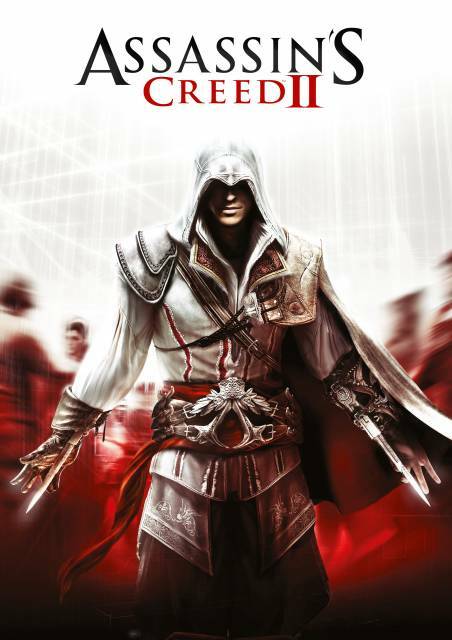 A DS game entitled Assassin's Creed II: Discovery as well as a PSP game entitled Assassin's Creed: Bloodlines, both from Griptonite Games coincided with the release of the game. In the first game, Desmond Miles, a man with assassin ancestry is captured by Abstergo Industries and is forced to go into a machine called the Animus. This machine lets him relive past experiences as his ancestors through genetic memory. In the first game players take upon the role of Altaïr Ibn-La'Ahad. The narrative of this game instead follows the exploits of Ezio Auditore Da Firenze, an Italian noble who is betrayed by the rival ruling families of Italy. Educated in poetry, and art, as well as trained in the art of swordplay and war, Ezio is both a scholar and a warrior. He is not, however, an assassin, although he finds himself moving down that path as he is faced with betrayal and murder. Over the arc of the story, many historical figures weave their way into the narrative, including the Medici, Leonardo Da Vinci (a friend and supporter of Ezio), and Machiavelli. The narrative focuses mainly on the struggles of Ezio, as he seeks revenge against those who betrayed him and his family and in doing so becomes a major figure in the Assassin's and Templar's centuries long war. Players now assume the role of Ezio Auditore da Firenze as the game's protagonist. He hails from Florence, Italy and has blood ties to Altair, as well as Desmond Miles, the modern-day protagonist in the first game. Assassin's Creed II is set in 1476 in Italy, and similar to the original game, the second iteration of the series will feature an over world, and will include locations such as Saint Mark's Basilica Cathedral, The Grand Canal, Rialto Bridge, and Da Vinci's Workshop. The city states of Florence, Venice, Romagna, and Tuscany are the setting of Ezio's journey. Unlike the first game where Altaïr was more of a lone soldier, Ezio this time has a sort of family helping him out. That is to say you can recruit people, or you can use family members placed on the streets, and have them be diversions or hide dead bodies. They can even help you out while fighting, and will join, when they think it's necessary. Your allies are into 3 guilds you will ally with through the game, The Mercenaries Guild, The Thieves Guild and Courtestans. The mercenaries are used for battle, the courtesans for distraction and the thieves for both. The structure from Assassin's Creed where you would go out investigate, kill your target and return back to your master has been scrapped. You can now take on the missions in different ways. There are 15 individual mission types this time, however, the developers can combine the mission types all into one, creating a completely new way you must play. At E3, the developers stated that they had roughly 200 unique mission types. Also the AI is now more ruthless. It can remember you, and will investigate if it thinks it knows you. To make it a little more difficult on enemy guards, however, players have the option of buying different outfits to disguise themselves. Various capes and dyes will also help you pull off different looks, making it that much harder for the AI to find you. Ezio, unlike Altair, wields dual hidden blades, a new and useful tool. Another new addition is the disarm technique; Ezio can disarm an enemy and take the newly acquired weapon as his own (until the weapon is dropped by selecting a weapon carried in the inventory). This is especially useful for the better armored and skilled blocker opponents. Strong enemies are also capable of disarming Ezio by knocking weapons out of his hand; the weapon will fall to the ground and can be picked up again, but if it is left forgotten Ezio must return to his Villa's war room to reequip the same weapon. He also has a wrist gun hidden under his sleeve where his double hidden blades are, and can obtain and use several different weapons from shops. Available weapons include: swords, daggers, spears (after disarming an opponent), war hammers, battle axes, and maces. You may also use weapons like brooms gained from citizens. These all tie in to the updated combat mechanic in the game, which blends elements of the system from the first game, such as counters and parries, and implements them in the more fluid, realistic combat system of Assassins Creed II. The developers aim to create a system that makes Ezio feel more like an assassin than a Warrior, encouraging the use of quick take downs over prolonged engagements with guards. To reinforce this feeling, Ezio will for the most part no longer carry any set weapon issued to him by a superior. The player can buy and upgrade weapons and items at shops, letting Ezio keep them constantly in his inventory and war room storage. The enemies Ezio will face have also been expanded upon so that now he will be forced to contend with both heavily armored guards, spear soldiers, swordsmen, and lightly armored foes wielding lighter weapons. Ezio's health no longer regenerates to the same extent, and although syncing will restore some health, players must consult street doctors or use medicine for more serious wounds. Hiding spots are no longer a guaranteed escape, as there is a new AI class-type named the seeker who can see through hiding spots. He can poke Ezio with his spear to draw him out of cover. You may still counter his attacks while inside cover. Assassin's Creed II also adds the ability to swim, which proves useful in the canals of Venice. Another notable ability is being able to assassinate enemies from hiding spots, such as hay bails. Other new features include a day and night cycle and a notoriety system in which Ezio will become recognized as he takes on more quests in each town; higher notoriety will result in civilians and guards becoming increasingly wary of the player's movements. This level of notoriety will be set within each city, so that while the player may be completely unknown in some cities, he may be infamous in others. The player may take on quests to bribe or kill informants and remove wanted posters in order to decrease his notoriety level, however some capes drop your notoriety in some cites. There are also many hidden items scattered throughout the world like the first Assassin's Creed. These include Gold Coins, Flags and mini statues. This time, however, collecting these items will unlock concrete bonuses: new items and rewards for players instead of just gamerpoints. There are fifteen mission types in Assassin's Creed II, a large increase over the number in the original, as there are now over 200 missions in Assassin's Creed II. Also changed is the fact that, upon entering the city, the player will not be forced to repeat the same side quests, in the same order, for each assassination, as they did in the first game. However, they have removed the passive quests of the older missions like eavesdropping or pick pocketing. Different mission types may be linked in a single quest: a robbery may turn into a chase, which may then turn into an assassination. Another feature is an all new economic system. Ezio is a rich nobleman and that's where the system comes into play. Along with the ability to pick-pocket people in the game to take their money, you can use that money to buy weapons and ammunition. Armor is available for purchase, as well as clothing dye to customize Ezio's outfit. You can also use the money to hire thieves and street hookers, if you didn't become friends with them before, for assistance in an assassination plot. To Increase your economic, you spend money to renovate Monteriggionni, giving you increased income per 20 minutes. Desmond Miles is given less screen time but more abilities than in the first game. In the first game, Desmond could only walk and talk, but in this sequel he participates in a few more dynamic, action-oriented sequences. The story starts with Desmond escaping from Abstergo with Lucy after viewing a common link between him and subject 16, that common link is Ezio Auditore, a Renaissance Assassin. After escaping Abstergo and getting to an assassin base, he meets Shaun and Rebecca, the field tactician and the Animus engineer respectively. Lucy convinces Desmond to become an Assassin to fight against the Templar threat. After Desmond agrees, they use the new Animus 2.0 to make Desmond relive the life of Ezio Auditore to learn his skills. The first sequence is Ezio Auditore's struggle against the Pazzi, and Vieri De Pazzi, after a battle ensues, Ezio shows off his fighting skills to his Older Brother, after the Pazzi Retreat, Ezio follows Federico to the doctor to heal up, the brothers than have a friendly race in which Ezio wins, after deciding to visit the Beautiful Christina, Ezio sleeps with Christina and flees the next day after her father finds out, making his way home, his father finds out about his misadventures and makes him run some errands. He also helps his sister with her boyfriend problems, his brother with feathers and his mother with Leonardo, making it their first meeting. After running another errand for his father, he comes back to find his brothers and his dad have been arrested, after having his family get to safety, he visits his father in prison, in which he has a short conversation leading him to a hidden room in his father's office which contains an assassin outfit, weapon and a document which he must take to Uberto to ensure that he wins the court case. After delivering the document, Ezio attends the trial of his family, where Uberto betrays them and sentences them to death. Uberto then tries to capture Ezio but Ezio escapes. Ezio meets Paola, leader of the Florentine courtesans, who helps him develop his stealth skills and how to blend into crowds. Ezio then goes to Leonardo to fix his father's hidden blade. With this new weapon and the skills he has learned, Ezio embarks on his first assassination mission and kills Uberto. After escorting his family out of the city shortly after telling them the truth, Ezio makes plans to leave the city and go to Monteriggioni, in order to reduce his notoriety. However, he is intercepted outside of Monteriggioni by Vieri De Pazzi, who tries to kill him and his family. An unknown man comes to the rescue, arming Ezio with a sword and helping defeat the Pazzi. Afterwards, the man reveals himself to be Ezio's Uncle, Mario Auditore. Mario shows Ezio around Monteriggioni and is surprised to to hear Ezio intends to leave and that he doesn't know about his Assassin heritage. He convinces Ezio to stay and train. During this training, Mario reveals to Ezio the details of the Assassin and Templar war. After his training, Ezio goes to see his Uncle Mario and helps him to infiltrate the city of the pazzi and kill Vieri. after succeeding and acquiring throwing knives. Ezio kills Vieri, then joins "The Celebration". After acquiring codex pages and taking them to Leonardo for deciphering, he learns some new assassination methods, he then makes plans to kill Francesco De Pazzi, the father of Vieri by visiting 'The Fox'. After spying on a templar meeting, Ezio finds out they plan to murder Lorenzo De Medici in public, after preventing this, Lorenzo De Medici, now with a dead brother thanks to the templars, urges Ezio to kill Francesco. After locating Francesco, Ezio kills him and leaves him hanging from the top of a building as a symbolic victory. After talking to Lorenzo and gaining a codex page, which Leonardo deciphers, Ezio gains a poison blade. After acquiring new skills from his uncle and a few assassination missions, Ezio discovers the location of his next target Jacopo De Pazzi, after tailing him to a templar meeting, Ezio is ambushed and captured by their headmaster, after putting Jacopo out of his misery, Ezio leaves to talk to Lorenzo and gains the medici cape, he then heads to Leonardo's to find out that he is moving to Venice for work, he catches up with Leonardo on his carriage and gets attacked by guards, As Ezio stalls them for time, Leonardo to make an escape. he gets to venice after helping a damsel in distress. However Desmond is ejected from the Animus 2.0 to test out the skills he has picked up, after demonstrating his impressive capabilities, he suffers from the bleeding effect and later experiences the conception of Altair's Baby in his dreams. After getting back to the animus, Ezio arrives in Venice, where he gets a tour. After seeing the corruption there, he decides to take out the person in charge. Ezio Encounters Rosa, a thief who gets shot with an arrow, he helps get her to safety to Antonio, the head of the thieves guild, who manages to get Ezio's assistance in the ridding the city of it's corruption. After helping the thieves guild, Rosa helps you learn advanced climbing techniques. Ezio and the thieves guild then launch an attack on Emilio, the center of corruption in Venice. After identifying his next target and tailing Templar Ezio looks for a way to get inside Palazzo Ducale. He concludes the only way in is Leonardo's flying machine, after figuring out how to make the flying machine work and planting fires all over the city, Ezio infiltrates the Palazzo. Ezio is then framed for a crime he didn't commit and becomes notorious. Ezio then acquires a firearm, the hidden gun. After learning more about his next target, Ezio makes arrangements to get access to him, needing to steal a golden mask from Dante, his target's bodyguard. After killing his target using his new pistol, Ezio goes to build an army for his next assassination. after a series of missions. Ezio gets a decent army and liberates Venice. After discovering of a cargo that the spaniard is waiting for, Ezio disguised himself to get to the spaniard. After disguising himself and getting close to Rodrigo, Ezio reveals himself and fights, all of his allies in the past come to aid him, revealing to him that they are all assassins and that Ezio is the prophet told of to open the vault. Ezio is then made an official assassin. Later after solving the mystery of the codex, they discover the vaults location, housing a god inside. Ezio leaves to Roma to get to the vault before Rodrigo does. After getting there and fighting Rodrigo, Ezio wins and fulfills his destiny as the prophet by passing on a message to Desmond about a future where mankind will be destroyed. There have been two DLC packs released for Assassin's Creed II. The first DLC pack takes place during Battle of Forli and was released on January 28th, 2010. The second DLC pack—Bonfire of the Vanities—was released on February 18th, 2010. These two DLC packs are loosely based off of actual historical events and will fill the two “corrupted” data files the game skips just before the final sequence. The "Battle of Forli" fills in Sequence 12 while the "Bonfire of the Vanities" fills in Sequence 13. The "Battle of Forli" add-on is available for $4, and the "Bonfire of the Vanities" be available for $5. Both DLC packs have Ezio partnering with Niccolo Machiavelli. “Battle of Forli” or Sequence 12 includes six new memories; once again, players will be able to pilot Leonardo da Vinci's flying machine. “Bonfire of the Vanities” or Sequence 13 includes 10 new memories, and features a new spring-jump ability for Ezio. Also, this DLC includes a new, unannounced district in Florence. A version of the "Bonfire of the Vanities" DLC Pack which includes all 3 in-game bonus maps from the Black Edition (for those that purchased the standard or white editions) is available for $7. Uplay is a service where you earn points and use them to unlock bonus items. Here is a list of Actions (achievements) and Rewards for this game. Assassin's Creed 2 was released with four total versions which include the normal game and three, region-specific, special editions. The award winning original soundtrack for Assassin's Creed II's was released on November 16th and was composed by Jesper Kyd, who was also the composer of the music on the first game. Ubisoft requires that all of their PC games need an "always-on" internet connection, as part of a new DRM and online services platform. All announced Ubisoft PC games will include the online services, whether sold online, or from brick and mortar stores. If you get disconnected while playing, you're booted out of the game. All your progress since the last checkpoint or save game is lost, and your only options are to quit to Windows or wait until you're reconnected. This happens even if the game loses its connection to Ubisoft's 'Master servers' on their end. Installing the game to the Xbox 360 hard drive requires 5.2GB of space. Copyright © 2019 Games Yay. All Rights Reserved. This website is owned and operated by Countess Cat Inc.